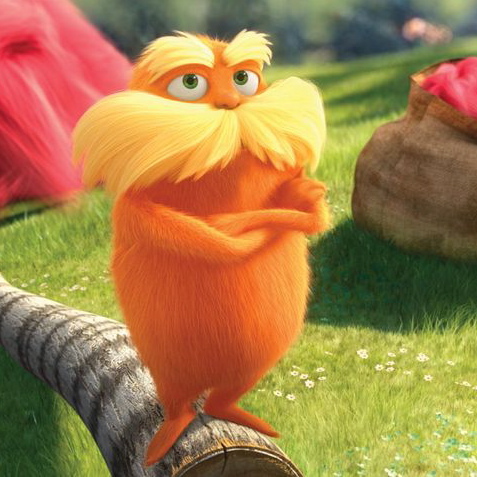 The Lorax (ably voiced by Danny DeVito) for the uninitiated is a story by Dr Seuss essentially telling the tale of the environment vs. corporate greed. 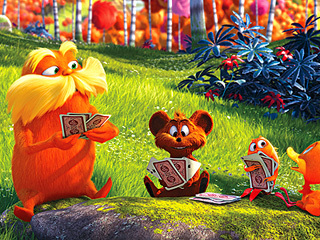 I won’t go into the intricacies of the “plot”, but it’s suffice to say that the film tells of how one man (the Once-ler, voiced by Ed Helms from The Hangover) tells a young boy his tale of how his lust for profits rid the world of vegetation and how he didn’t listen to The Lorax: the guardian of the trees. He then entrusts the final seed in existence to this young boy for him to do with as he wishes. If this sounds a bit hokey, then that’s simply because it is. Seuss’ original story is incredibly short and is a bit like a parable; ending on the cliffhanger of “will he or won’t he”. But this is a children’s movie, not the infuriating ending to Inception, so expect no ambiguities… in fact, don’t expect much at all. What you can expect are modern-day animation staples such as beautiful rendering, celebrity voices and a paper-thin romance. It’s the latter that really undermines the ethos of the film, with Ted (Zac Efron) wanting to find the tree to get in there with his crush Audrey (Taylor Swift). Seuss’ original vision is somewhat bastardised here, as this kid doesn’t really give two Humming-fish about the environment – he’s fulfilling his basic human urges… to get a smooch! C’mon, he’s probably 10, he’s not looking for some hanky panky with a 13 year old girl. Well, that might be the norm in certain districts in a town or city you know, but I’m certain that’s not the case here. 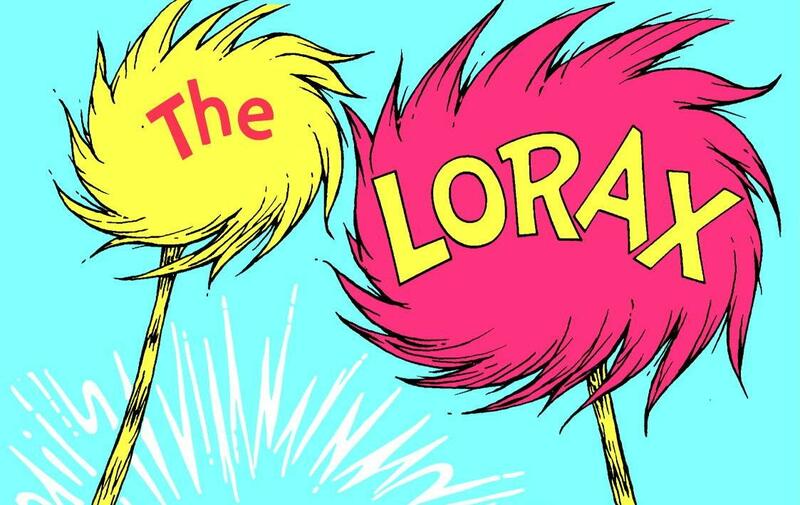 Yes indeedy – the Lorax LOVES a car powered by petrol… made from trees. A confusing message to send out you say? Well that pretty much sums up the entire film: confused. Most of the “extra” material not mentioned in Seuss’ book is simply padding to give context and get to the Lorax part of the tale (and he only sticks around for about 1/2 the entire film). All of these shortcomings just compound how bitter a pill this is to swallow, as it looks beautiful – the animators have rendered Seuss’ world with such loving detail; it’s just a shame that the script has all the charm and charisma of a tin of stale sardines. Place your bets for a good review… now. So what about the humour? Surely this film succeeds in that area? Well, I’m afraid not. Whilst I found Ice Age: Continental Drift unexpectedly engaging and genuinely funny in places, I found myself sitting there like the Grinch for this film. And others in the screening reflected this mood. There were muted sniggers from some, and the kids laughed every time a bear or fish made a meaningless squawk, but there was nothing really entertaining about the script. And let’s never speak of those joyless songs. That’s why it’s such a shame to hear that DeVito not only recorded his voiceover in English, but also in Russian, Spanish, German and Italian despite speaking none of these languages: he did it all phonetically. This is a simply mind-blowing approach to voiceover work, which is why it’s so soul destroying to see a film of such lacklustre calibre after all that effort. I really wanted to like The Lorax, I really did. I always root for an underdog, and after disagreeing with fellow critics’ opinions on Ice Age: Continental Drift, I thought I too might find some green shoots of quality on which to feast, but instead was left with a mouthful of tarmac. If only the Once-ler had obeyed the laws of basic economics and just replenished his supply of trees as he went – he’d have made untold profit and kept the environment going… and also prevented me from needing to sit through 86 minutes of poorly-scripted cinema. 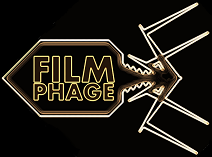 as the fable of The Lorax has left The Phage somewhat morose. the story’s dreadfully weak script makes one call one’s sanity into question. can render this film’s flaws so easily forgot. but you can’t help but wonder what next of Seuss’ books Hollywood will pinch. I’ll end this little ditty and bid you goodbye. This entry was posted in Review and tagged children, Danny DeVito, Dr Seuss, Ed Helms, environmentalist, film, Ice Age, review, Taylor Swift, The Lorax, Zac Efron. Bookmark the permalink.